Photo by dan cronin from the Torontoist Flickr Pool. Rob Ford isn’t the silent type. When our mayor has an opinion about something, whether it’s bike lanes, gravy trains, football, subways, or any of his other projects or pet peeves, he usually makes himself heard. Up until last Friday, when he finally decided to trek out to Brampton to endorse Stephen Harper, Ford had been unusually silent about the looming federal election. Well, no longer. Now that he’s made his choice, our mayor has been using his dialing finger to send Torontonians a message. 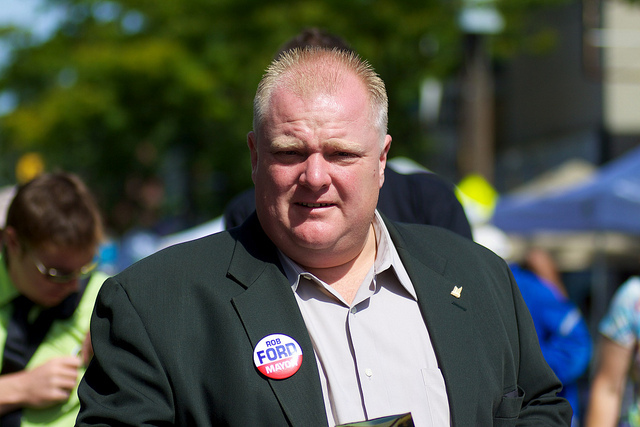 In the 2010 mayoral election, Ford carried all of the wards in Etobicoke by more than 50 per cent. If Trottier wins tomorrow, or comes really close, Ford can argue that his personal appeal made all the difference to an unknown and untested candidate. In that case, Ford’s star continues to rise. But if Trottier loses badly, Ford’s perceived influence over Etobicoke and the rest of suburban Toronto takes a hit. In all likelihood, Ford’s made a smart bet. With Liberal support waning and the NDP on the rise, Etobicoke’s Conservative candidates are likely to poll closer to their Liberal opponents than in any election in the past two decades.